We spent much of our third day travelling in Arizona! It’s always tempting to sleep on long journeys, but there were so many sights to look at you didn’t want to! Our first stop in Arizona was Lake Havasu! It was so sunny and beautiful, and there was so much to learn about here! 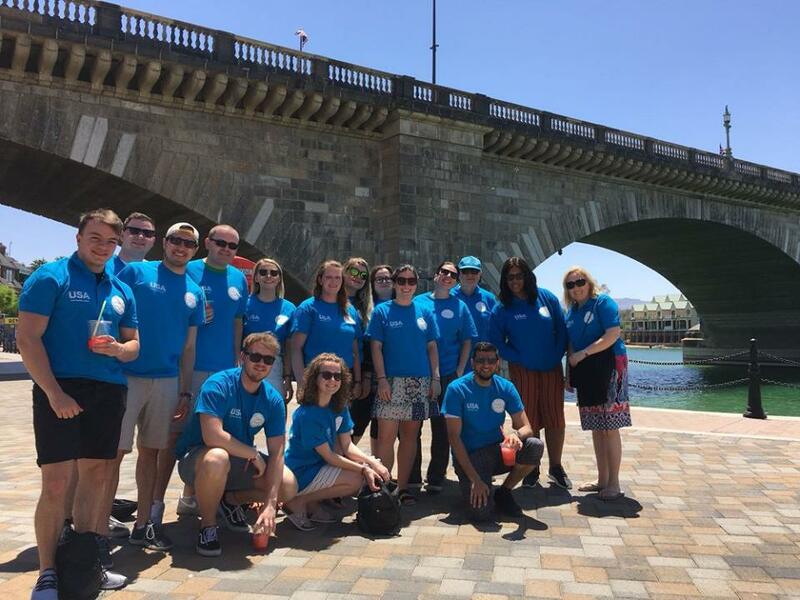 For example, Lake Havasu is the hottest place in USA where people actually live, and is also home to the original London Bridge after it was relocated to Lake Havasu in 1967! The best way to see Lake Havasu is of course by water! We embarked on a one hour cruise with Copper Canyon Cruise. We waved at locals relaxing enjoying their weekends on their private boats, while our informative guide taught us more about the history of Lake Havasu. Following Lake Havasu, we travelled on a segment of Route 66 towards Peach Springs! We stopped at the infamous Hackberry General Store which sells a great selection of Route 66 memorabilia and gifts. 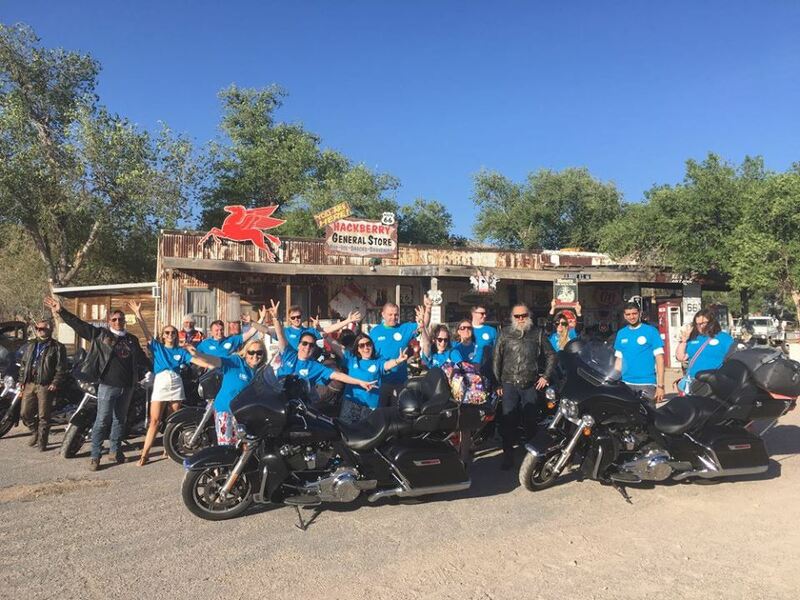 A group of Italians who were completing Route 66 on their Harley Davidson motorbikes arrived at the same time as us, so of course we had to have a photo! The next day was my favourite day of the trip – truly unforgettable! We left Peach Springs in the morning to go off-roading along a bumpy track towards the Colorado River. The views on the way were amazing – no one was around, it was so peaceful (until our bus drivers warned us about rattlesnakes!). 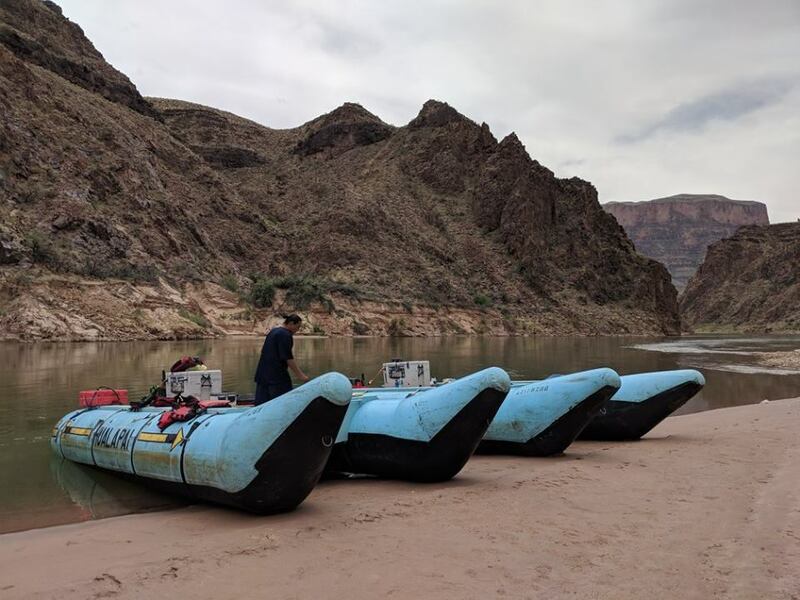 Firstly, we experienced the Grand Canyon by water as we embarked on our river rapid journey with Hualapai River Runners. It was amazing! Within minutes we were all absolutely soaked. On the stronger rapids we went 10 foot into the air – losing sunglasses and sunhats along the way. We made a stop along the river so we could hike to the Travertine Falls, before continuing with our journey along the Colorado River! When our journey ended, the excitement wasn’t over yet as we met with Papillion Helicopters who flew us over the Grand Canyon! It was amazing to see from the sky the journey we’d just made along the river. I was sat next to the pilot (I’m not sure if that made me nervous or more excited?!) 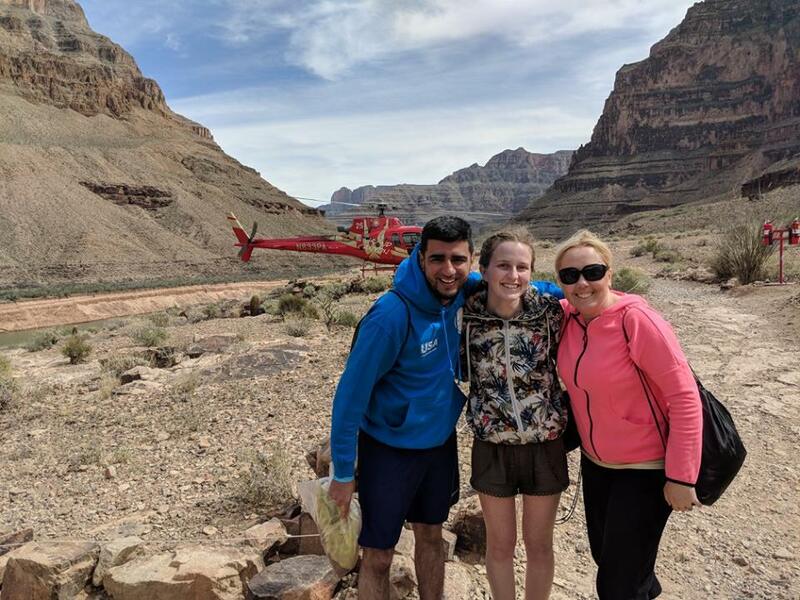 When we landed, our fantastic hosts Lucy and Phillip surprised us with tickets to go on the Grand Canyon Skywalk – a glass walkway on the edge of the Grand Canyon West! 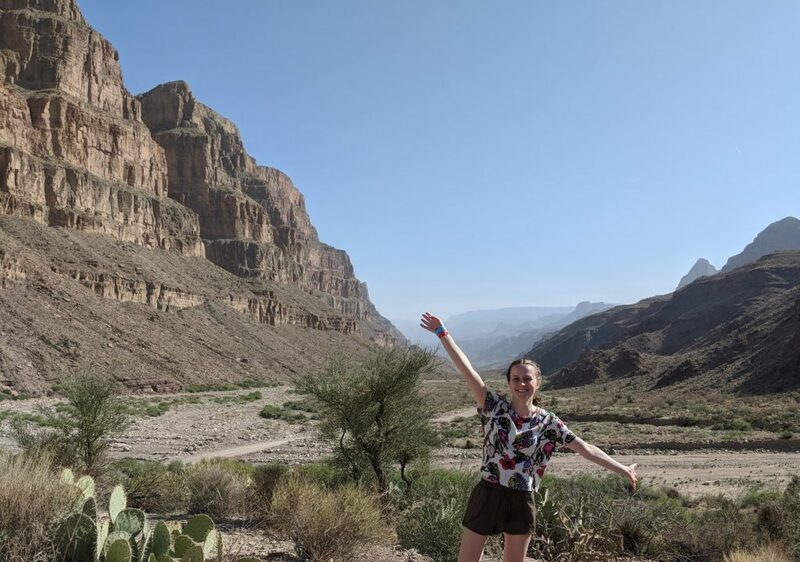 By this point we’d now seen the Grand Canyon by water, sky and land – hence why I described this day as unforgettable! After our Grand Canyon adventures, it only got better as we travelled to Nevada to spend 2 nights in Las Vegas. We stayed at the trendy SLS Las Vegas, which is located towards the top of the strip opposite the Stratosphere Hotel. They offer a great range of breakfast at their Northside Café. 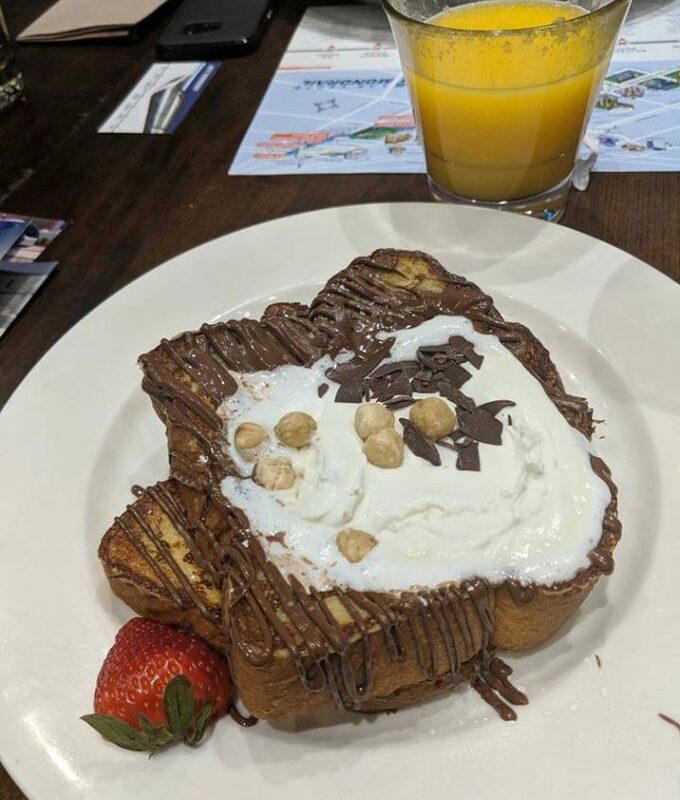 I chose “Nutella, Cream, Hazelnut and French Toast” which was absolutely not one of my five a day! We managed to fit in a lot of activities in Las Vegas! 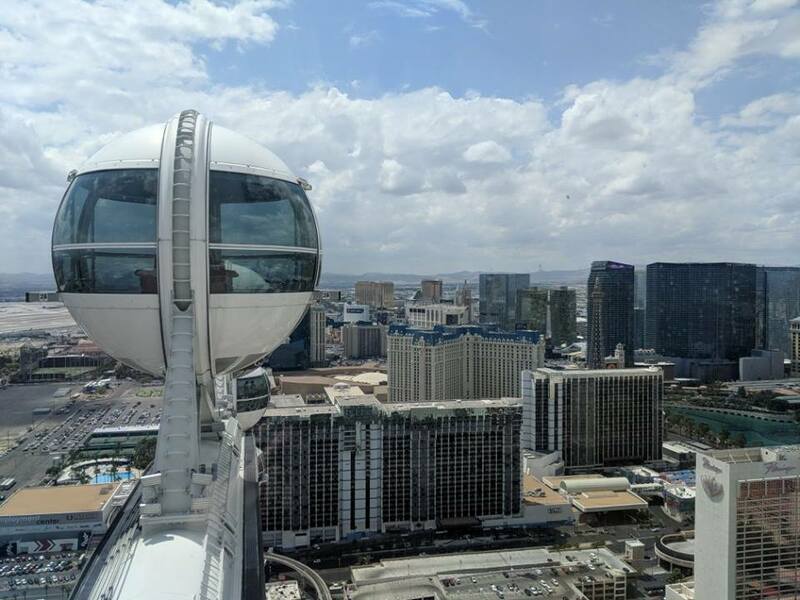 We did the “Sights and Sound” Pink Jeep Tour which included a ride on the High Roller. We also got the chance to meet the lovely lady who wrote Elvis Presley’s wedding vows! Then, we drove past many of the famous hotels (New York-New York, the Venetian etc.) and we couldn’t believe how ginormous they were! We concluded our time in Las Vegas with a game on the fruit machines within the MGM Grand Casino (I lost), before watching “KA” Cirque du Soleil show (also at the MGM!) 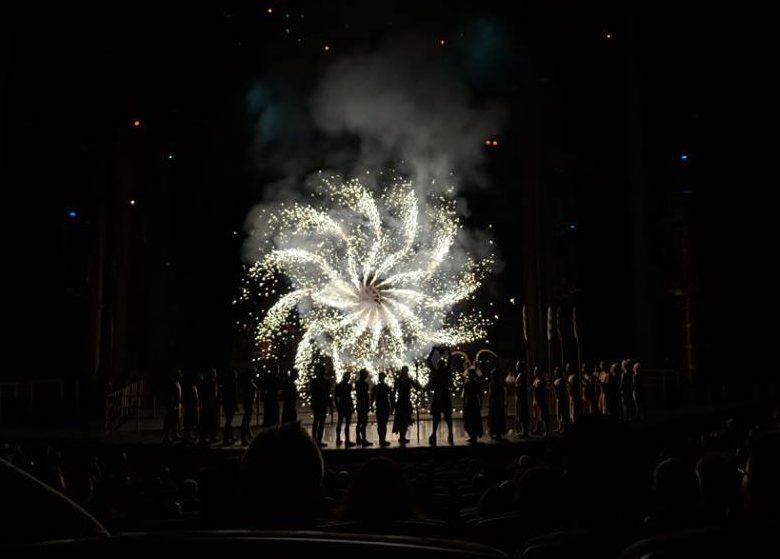 What an incredible show that was! My mouth was probably wide open with amazement for the duration of the show! Next up…MegaFam finale in Nashville! Do you want a holiday with a variety of world-class hotels and awe-inspiring landscapes and activities? Place an enquiry and our expert travel advisers will contact you shortly!